In today’s dynamic global economy, the importance of construction cost management cannot be overstated. The success of your projects and investments depends on your ability to control costs effectively. To do so you’ll need access to cost data you can depend on. In the past, finding this information was extremely difficult. Comparing construction costs across various European countries involved labor-intensive research and extensive calculations. ECC has changed this. 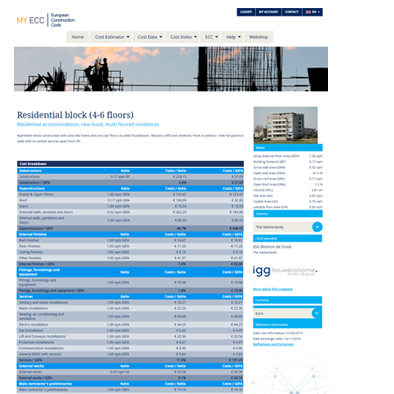 Our concept combines local construction cost data and indices from a wide range of European countries into one central database. As a member, you’ll be able to access all this information through our unique online calculation tool, allowing you to gain effortless insight into costs and keep your projects under control with ease. Easy-to-use reference for project developers, architects, investors, builders and more. Keep track of cost developments across a wide range of European countries and plan accordingly.